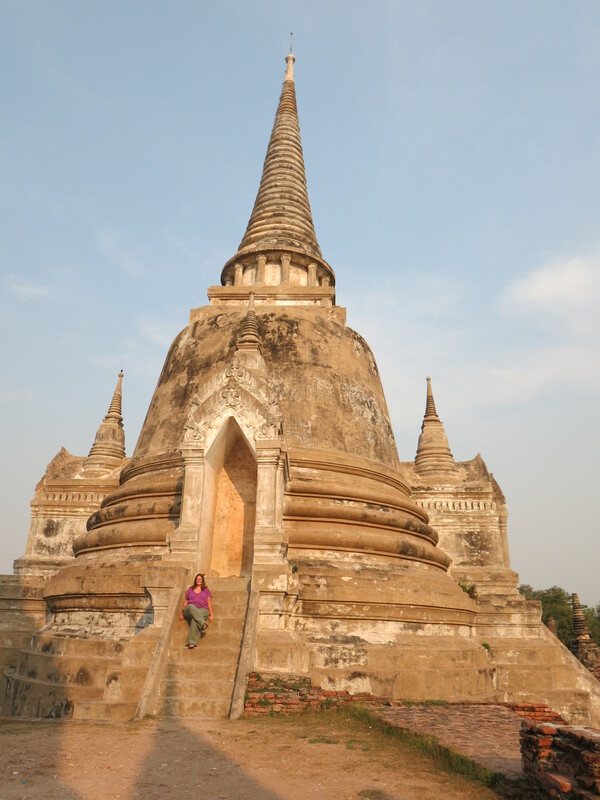 I like to pretend that my short time in Ayutthaya, ancient capital of the kingdom of Siam, was spent in the manner of a ruler from that era: whisked from magnificent stupa to impressive monument in my personal chariot, all doors open to me. In reality, of course, I bounced along in the back of a tuk-tuk and paid the same entrance fees as everyone else, but when the afternoon sun is beating down and you only have a few hours in a place when you’d planned to have two days, you have to inject a little romance where you can. 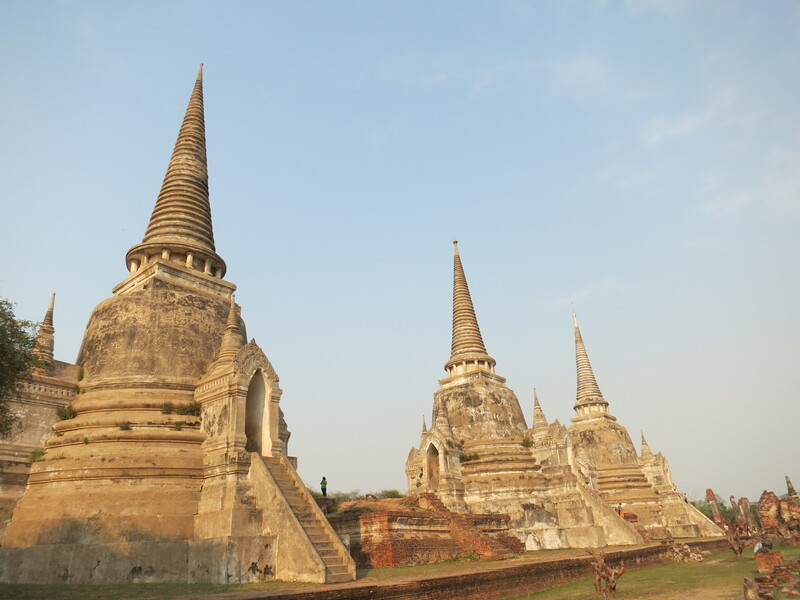 Ayutthaya is a World Heritage site, and as such it’s better maintained than many tourist sites in Thailand. All the guidebooks suggest renting bikes to get from one site to another, which sounds nice in theory, but in practice it still means dodging terrifying traffic and sucking in mouthfuls of exhaust. Some friends did bike to different temples, and they said those were the problems exactly, plus it’s super hot, of course. So all in all, I’m glad I paid $20 for a driver to take me door-to-door for three hours. 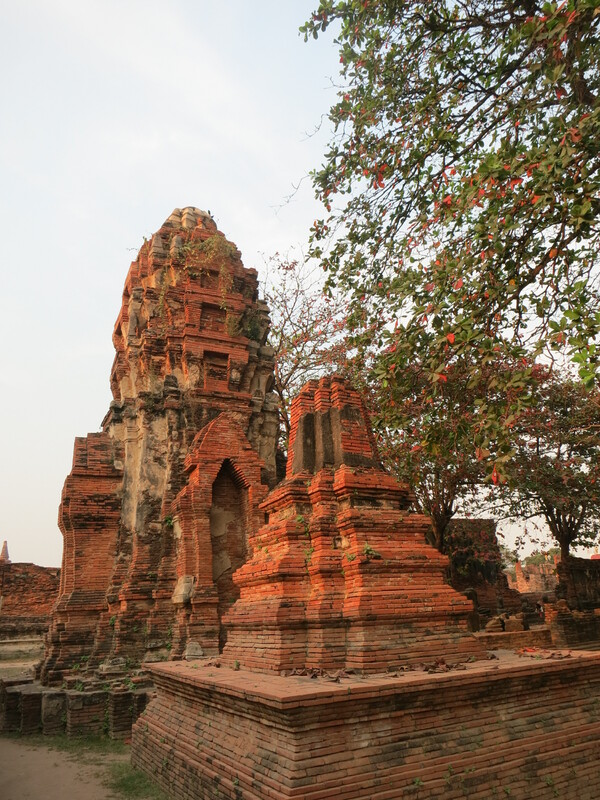 The city of Ayutthaya was founded in the 14th century, and at its peak at around 1700 CE it had 1 million inhabitants, which made it one of the largest cities in the world. 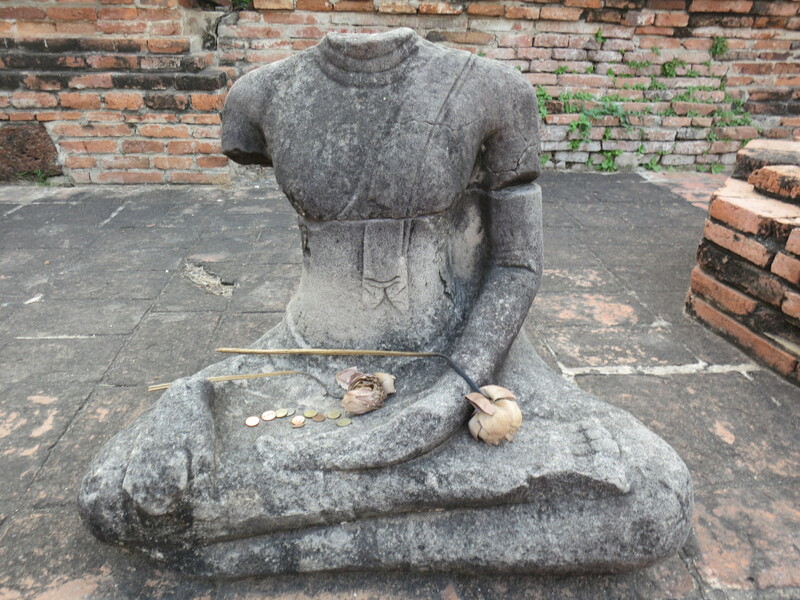 In 1767 the Burmese invaded, burning the city to the ground and committing blasphemous acts like cutting the heads off the stone buddhas in the temples. The kingdom would be fought over and rebuilt over the next few years, but the capital was never re-founded on the same site, and it’s remained in ruins to this day. 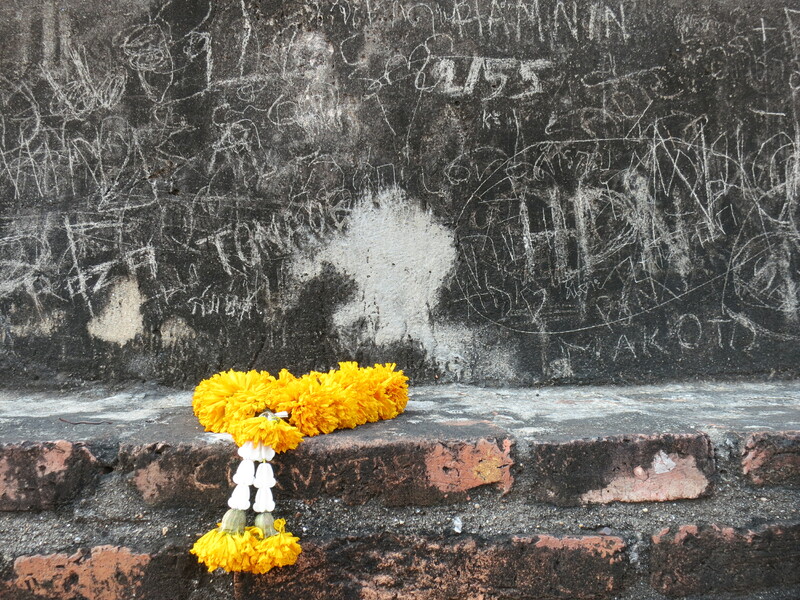 Some of the temples seemed to be out of use, while others contained buddha statues, yellow or saffron cloth coverings, and other signs that they were still active places of worship. 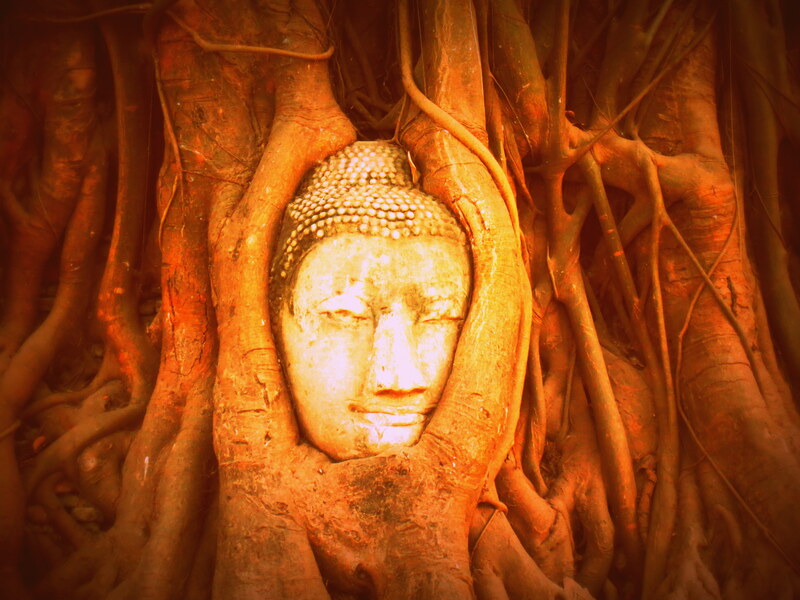 Guards stationed themselves by the head in the tree of Wat Phra Mahathat to make sure people took respectful photographs. 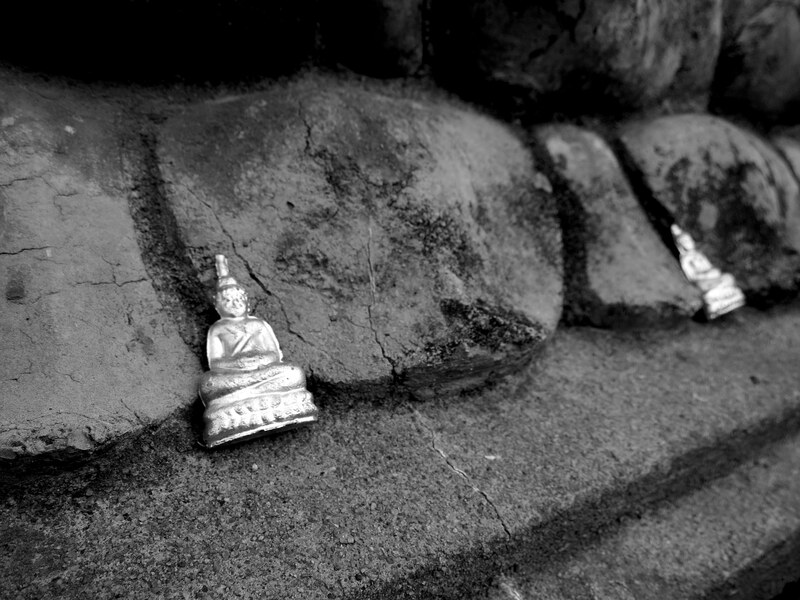 It’s considered disrespectful to put your head above that of a buddha or monk, so any time you’re in a temple you have to watch yourself. Since this particular head somehow got wrapped up in the roots of this tree, it’s even lower than statues usually are, and you have to kneel on the ground to make sure you’re not breaking any taboos. I visited Wat Phra Sri Sanphet, which a fellow American told me was the site of some scenes from Mortal Kombat–look familiar, anyone? 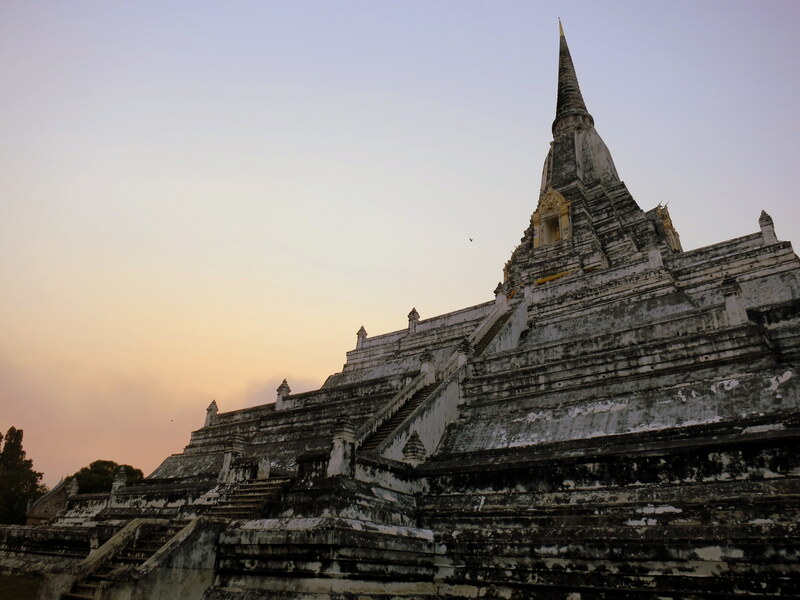 The last stop of the day, Wat Phu Khao Thong, was one of the nicest simply because the sun was going down and the site was deserted. Once my driver dropped me off at the bridge that served as the entrance, it was just me and a determined evening jogger as the sun descended and the temple folded itself in shadow. 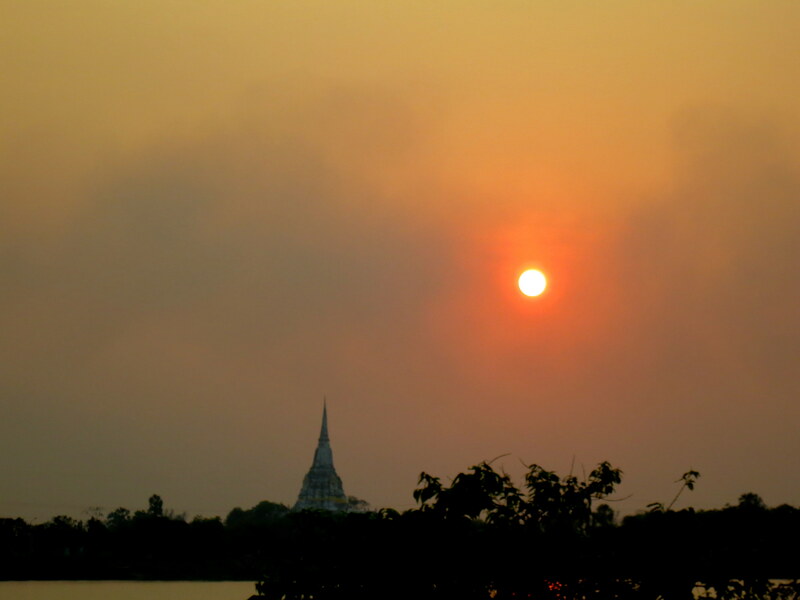 It was a peaceful end to a busy afternoon of temple-hopping, and kudos to my driver for arranging it that way. 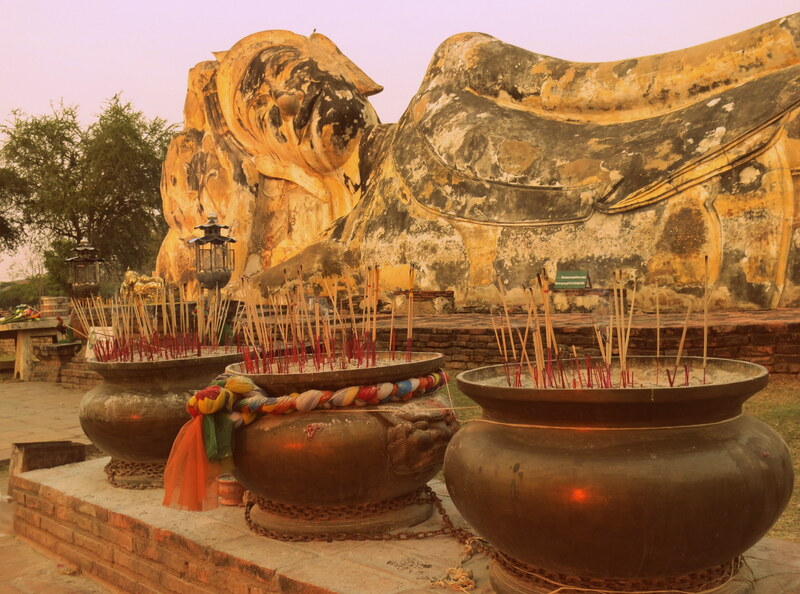 This entry was posted in Thailand and tagged Ayutthaya, buddha, buddhas, headless buddha, Mortal Kombat, Phra Budhasalyart, Siam, stupa, temples, Thailand, UNESCO, Wat Phra Chedi Chaimongkhon, Wat Phra Mahathat, Wat Phra Sri Sanphet, Wat Phu Khao Thong, World Heritage sites by lisafindley. Bookmark the permalink.